What are you afraid of leaving when you travel? If you are not afraid, then your work here is done. But if traveling scares you, then read on. Be not afraid. Be very afraid. Okay, maybe it will be okay. Flying in to Barcelona the sun splayed its last gorgeous rays across the Mediterranean. This port of many cruise ships was where people, lots of happy vacationing, drinking, paella hungry people would be cruising. Barcelona was the center of culture – art, cuisine, architecture, music – and tourists as we soon found out, LOVED Barcelona. My stomach was upset. There was a level of comfort left behind as we got off the plane in Barcelona. But this comfort was the kind that comes from the outside. Comfort that you could pick up and walk on with. Hold. And like any kind of physical comfort, it was an illusion. Wasn't it? I realized with a frisson up my spine that lo and behold, indeed I was a little afraid of doing without. Pilgrimage meant facing some things I had successfully avoided in my life. If anyone asked what that might have meant I might have tried to come up with something lofty and that would have cast me as a lofty creature. A lofty creature who cried like a baby and craved Creature Comforts. The truth was simple. As calmly as I could I whispered the first comfort I would miss. Coffee. The coffee I meant was deep dark rich coffee. You must know what I mean. The kind that begins when you pour the oily beans into the hopper of the Maestro Baratza every morning and then press the button on the burr grinder. Almost simultaneously the red water kettle whistles it's completed it's boiling task and gets turned off to cool a little bit while you unload the dishwasher. Soon enough these coffee grounds, fluffy like loamy rich soil, these grounds get covered with just below the boiling point water. You wait and pour in more water as the grounds absorb so much more than you ever thought possible and you don't, of course you don't, want the coffee to be too strong. Then there's the chopstick that stirs it all together and ahhhh.. The coffee is strong enough and releases it's aroma through the walls, the house, the woods, the cul de sac, and in my imagination, the entire coffee desperate world. For this coffee I would be missing I would then cover the 15 year old gold-domed French Press Pot with a towel and lower the plunger ever so slowly and deliberately. Steadily a thick black stream poured into my cup and anyone else’s who was sitting at the morning wood table. Jaryd Snover, Erick Snover, Jeremy Salamon, Alice Hall, Trevor Dolan, Madeleine Hill Vedel and Damon Fowler. Yes, all these and more have sat or stood with coffee in their hands looking out the bay window at the wrens and cardinals at the feeder. Here also was Almond milk. Honey. Ice, if it was the beginning of a hot summer day of kid-chefs. And that was all there was to the lost comfort of coffee. Bwaaaaaa. I blubbered like a lost child to think of it. Or was there more? Would I miss the ritual of making coffee for others? Sharing it? Why was Coffee Time so much more than just, coffee? What did it all mean? I wiped my eyes and blearily stared into the faces of the crowded Barcelona night. The very bricks of the street were curved in this Wonderland of walking. I tried to walk steadily. I practiced saying Cafe Con Leche to calm myself. Cafe Con Leche. Cafe Con Leche. Everything would be ok. So far no one suspected me of this crazy weird affliction. Hunger. Others Without Coffee, Tumbling in Madness on La Rambla. Along with the fear of no coffee was no books to read. Books. Are. Everything. Books of the kind that you wake up craving. (Along with that coffee.) The scent of books and print, paper like when you walk into an old secondhand bookstore like Librairie Gourmand or Shakespeare and Company in Paris or Nice Price Books in Carrboro or The Bookshop of Chapel Hill. But oh, yeah, I jostled and tightened the straps. I had books with me. Right now in my backpack. They were there. Right on my back. 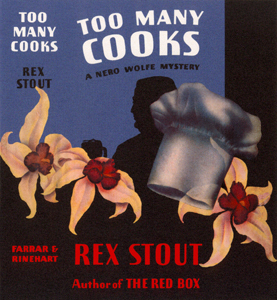 There was Too Many Cooks, A Rex Stout Mystery. 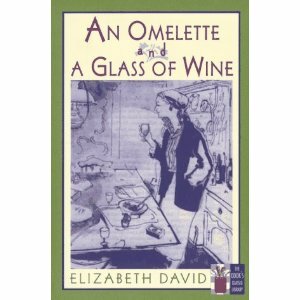 And Elizabeth David's An Omelet and a Glass of Wine. But I wasn't carrying them. No. They were Carrying Me. For everyone knows, not only are books everything but books are a way to carry a world within while you were traveling. And in this new world you could look up and safely saunter, and enter this new world while you were holding (clinging to?) another world. This world colliding thing was a mirror like duality, was it a polarity coming into play? Boy, I was in for some long and serious and lonely trouble. At the rate I was going I wouldn't have anyone to talk to on this walk across Spain. Not with this dire strangeness tumbling from me. Or maybe this wasn't strange talk at all for what I was about to be. Or maybe I already was what I was to become. I could say it. I was becoming A Pilgrim. As newly born Pilgrims we had just debussed from the Blue Aeroport 2 doors and stopped a policeman to ask where was Boulevard Ramblas? He pointed and we turned at the Hard Rock Café, my backpack feeling heavier and heavier. How would I walk to the other side of Spain with all these books? I wouldn't I said, sternly. You are going to have to be brave, books. Books, you will be left somewhere where someone else will find and care for you before we get to Pamplona. Lord, why was I being so dramatic? Could I be as brave a Pilgrim as I was asking my books to be? Silly, these thoughts were silly. We walked down La Rambla, the crowded bustling (I wanted to say rambling,but that too was silly) pedestrian walkway from Placa Catlunya. It was close to 10:00 pm. It was silly to be in a panic about not having coffee or books when we had something real - and not imagined - ahead of us. Where was Hostal Campi? And dinner? Maybe this was yet one more thing I had to face besides coffee and books. Wake up. Walk up. Walk on in the dark. And just and simply be where I was. Not worry about tomorrow, next month or something as delicious to contemplate, yet safely tucked away, a whole year from now. But now that I was paying attention as a Pilgrim, where on earth was I? We turned onto Carrer de Canuda and rang the buzzer to Hostal Campi. I had no idea what was waiting for us. I breathed. I smiled at Rich. Yup, he had no idea what I was thinking. But I had no idea what he was thinking. This was just the beginning. Only the beginning. Just the start of being where we were. And nowhere else. Being was ok. Coffee beaning! And Pilgriming. Lord help us.